Concentrated dye solution makes it easy to apply beautiful color to your project. Mix with water for an economical, non-flammable stain or with alcohol/ lacquer thinner for a fast drying, non-grain raising stain. For use as a finish toner, simply add the dye concentrate to shellac, water-base finishes, solvent lacquers, and catalyzed varnish or lacquers. Shipping Restrictions: Ground Transportation Only to addresses within the continental United States. Very happy with these dyes! You can thin with water for a softer take on the wood. I was hesitant buying a bottle at >$20, but it works great. This bottle will last a LONG time. Nice vibrant red. Makes my shop rags look bloody, which has been a good gag. I’m using the red for Xmas gifts. I plan to pickup more colors next time they are on sale. So far, I’ve been using these on the lathe just like any other finish, then putting a friction polish on afterwards. Not sure if that’s how they are supposed to work, but it dries and comes out nicely. One or two applications did the job on scratches and worn areas. Gloves recommended. So much fun getting the exact color you want. First time using dyes and I'm hooked. So much fun getting the exact color you want. Provides a vibrant color, good penetration. I dilute it 1:32, so it goes a long way. According to the directions it can be mixed with several things, I personally am using acetone, so it dries very quick (less than 5 minutes) so I can move on to the next step. I used 1/3 of 2oz bottle to tint 1 qt can of water-based clear base from Lowes. Works perfectly. Likewise, I mix a few drops (10 - 15) of Honey Amber in a spray bottle of water to prep wood, and it works just as well as a spray gun. Water based stains are SO forgiving. I mix mine with denatured alcohol, keeps the grain at bay. Amber over black on curly maple. 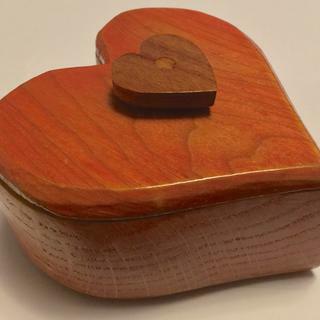 Keepsake Box amber over black on curly maple. Very easy to use. Easy to mix with water. You can also put a few drops on a damp cloth and wipe on without diluting for a darker stain application. Another way I've used it is to stain the wood one color and after drying, use another color to stain "streaks" for a beautiful effect. After drying spray a light coat of poly from a rattle can, give a very light sanding, then fill grain as needed according to wood type and desired finish. Then spray with General Finishes High Performance Polyurethane. The end results are spectacular! TransTint dyes are excellent for laying down a good "base" color from which to "glaze" stain on top, or mix into a topcoat or poly to add color and depth. The range of available colors is immense, and the dye is "super-saturated" so a little can go a long way. Great for creating a "Sunburst" guitar finish or a warm glow on furniture. Yup ... I like ! Easy to mix and use, I like it much better than stain. I would recommend this product. Very powerful. Go easy on application. Dries very fast, even with water. Plan and be quick! First using dye, and worked great. Diluted in denatured alcohol, Transtint was just the dye stain I needed to work fast to get the finish on in one overnight job in an airport. 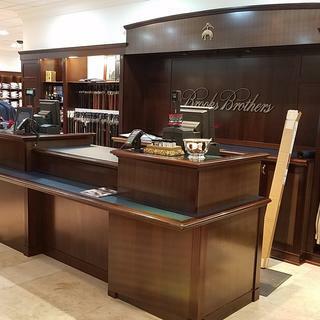 I got all the scratches repaired for this airport retailer in one overnight with Transtint. I repaired some Chinese chairs (loose joints). Unfortunately, in the process of taking it apart, there were some tiny chip-outs. 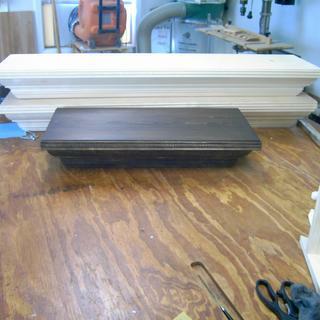 Wood filler plus red mahogany dye made them disappear. Sweet! TransTint dyes have worked well for me mixing them both with WunderFill wood filler (usually white), and platina shellac. One mix on a test piece, carry out the rest of my finishing program, and I can get exactly the color I want with a small adjustment when finishing the real work. Bright Red TransTint dye, plus white WunderFill on cherry and oak. Dark Walnut dye on white pine. Did a great job on my project. Using alcohol to dilute you have to apply very quickly to keep a wet edge otherwise there will be overlaps visible as the alcohol evaporated very fast. Excellent to get an expensive look on low cost wood. Have not tried diluting with water to prevent raising the grain after sanding. I’ve used it to tint shellac as a way of staining otherwise blotchy maple. Using the dyes I have been able to duplicate the color of existing, old woodwork. There’s simply no other way to do it. The dyes are great. I use them to mix with epoxy mostly. 1 bottle came with a broken cap but Rockler replaced the whole bottle promptly. Great service as usual. Works well. I would recommend buying a class jar with this so you can keep larger amounts of dye for your next use. I have been fighting with stains and oak for a long time. I have a hard time getting it dark enough. I bought three bottles of this dye, blended a custom color mixed with alcohol and applied. Great results. I won’t go back to stain any time soon. 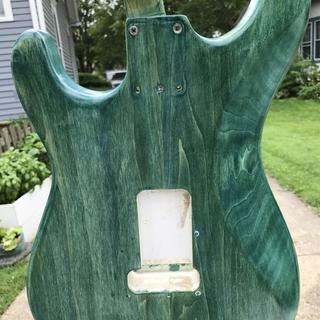 Used this dye to even out the wood color and raise the grain. I then applied shellac cut to less then two pounds and applied a cinnamon colored stain. Topcoat is polyurethane. The tint worked perfect. I needed to darken the edge of live slab where bark was missing. I used a couple drops and mixed with denatured alcohol and worked amazing. Great for getting a rich, dark base prior to staining craftsman oak furniture. I use tint for all my new furniture, as well for restorations. Great stuff, and worth the price, but BE CAREFUL! I was looking for some way to tint a shellac finish for a piano top so I tried this. It really does work well, but when they say use very little they're not kidding. It is extremely concentrated. I eventually used just an eyedropper of the stuff to get the color I wanted for an entire lid. 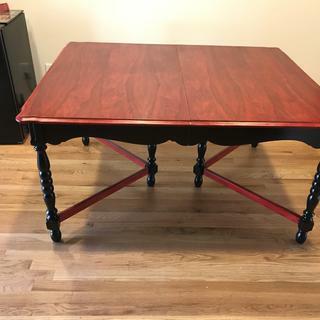 I built a Greene and Greene table for a client who wanted a finish to match A Stickley chair he owned. 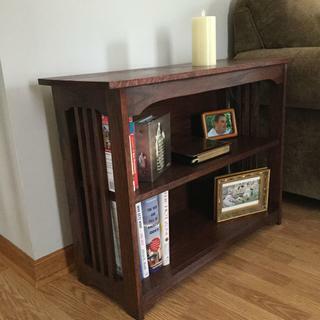 I found a link online that described how to match various Stickley finishes. This dye was part of the process. I had never used dyes before, but the finish was a perfect match. 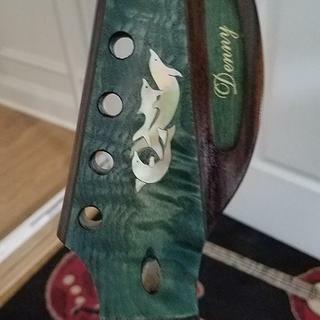 These dyes worked perfectly for my guitar project. These dyes worked very well and allow infinite color shades by varying the strength of the mix and with the number of coats applied. I now own 4 of the transtint dyes. I am still experimenting to find the color that I want on the finished product. Transtint dye seems to mix well and a few drops makes a difference. Wear gloves while handling or your fingers will be stained. Good product, does what it is supposed to do. Small increments into the shellac/poly/conditioner/ to gauge color with many color options to choose from. This is the first time I used these dyes and they gave a depth and consistency to the finish, Practice on scrap first its easy to use too much. I use these dyes for staining the electric guitars I build. They mix superbly with lacquer, epoxy, alcohol, and water. Trans Tint is available in multiple colors, although the color I use most often is black. It works beautifully mixed with denatured alcohol. For what I need, this is the best "coloring" product available. These work well in water or alcohol. Better and easier to use than powdered dyes. Great product, easy to use. It did exactly what I needed with the results I was after. 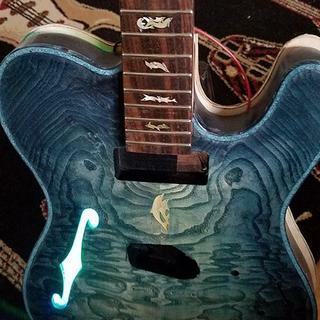 I used denatured alcohol as a base, I had some residual gunk left over on the guitar that blotched and made some blue spots, overall good stuff. Less is better when tinting epoxy. I made a quart of dye using transtint and was very satisfied with the results. Applied evenly and penetrated nicely. Would not hesitate to use agian in the future. Best product to save me time and money. This stuff is strong. Just a few drops is all it takes. Wear gloves because the tint does not wash off your skin, it has to wear off. Just be careful when you open it. They don't leave a big air bubble. They fill it to the top to give you your money's worth. And man, is it concentrated. Also, very important -- wear gloves. The only way to get it off is with a scotch brite pad. 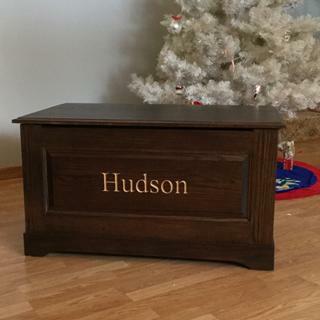 But I really like the color without the "mud" look of conventional wood stain. Easy to work with and adaptable to many uses. I used the TransTint to color epoxy for a pen blank coating. It worked very well. Great product. I've been helping my wife with a craft project that required wood to be different colors and these wood dyes were/are perfect. Just be careful, it runs even worse than wood oil. Predictable, repeatable performance. Just what I am looking for in a dye stain. 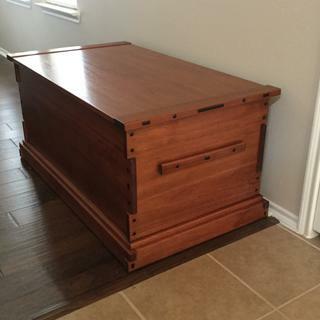 Greene and Greene inspired blanket chest built from red grandis dyed with TransTint brown mahogany. This is an excellent dye for woodworking, BUT, you really need to experiment with different mix proportions to get the desired results. Follow the OEM instructions for a good starting point, but play with it a bit. I found a light stain sealer helped get a more consistent result, especially on open-grain woods like Oak. Was able to achieve an even color throughout notoriously tricky open-pore red oak and oak veneer. Used half alcohol, have lacquer thinner as solvent for reasonable working time. Extra bonus - by using this dye instead of stain, was able to pre-color all parts before assembly and still get excellent glue bond between pieces. Beautiful, even "Dark Walnut" color on red oak. 3oz/qt ratio, alcohol/lacquer thinner solvent. 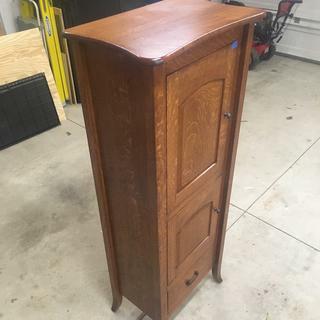 Restoring a walnut mid-century chair and am trying to make a stain that will be similar to what was on it originally. I thought that these color's/dyes would provide the various color I want for the items I am planning to make. I saw a video where they used this dye in shellac and also in a sanding sealer and the color came out great. Looks like it may be a good option for adding color/tint to difficult-to-stain woods like maple...at least I hope. I need to match stain from an older set of cabinets.....Heard great things about Transtint. We've used the product before and am pleased with the results. To use it on walnut wood. Wood Whisperer Mark Spagnola recommended on his youtube channel. 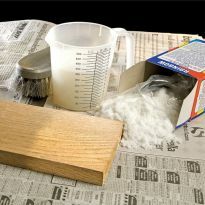 Par a finishing article for oak furniture in Fine Woodworking. Hoping to be able to get some colour into some hard maple. First time buyer of this product. The reviews were very good so i decided to give it a try on the current project that i am working on. These dye stains actually work. True to color every time. I'm using this dye combination to simulate old worn barn wood, per Scott Wunderwood. Better color than other dyes. Can play with colors by just adding water. I have used another color of this dye to tint water based varnishes and liked the results. I needed a different color. I want to enhance the grain without coloring the wood. I saw this item being used on YouTube. 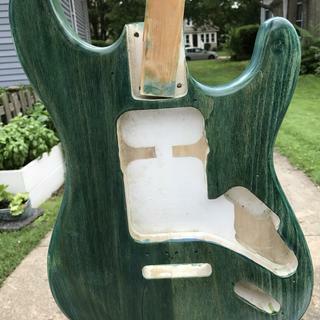 To dye a guitar project I'm working on. Because the project I'm working on needs that particular color, and stain doesn't work very well on curly maple. Use this item to finish bracelets with. Works well with poly. Trying to match some antique furniture. This seems to be well-regarded for tinting shellac. How do I add this to epoxy? Should it be thinned? If so, by what? BEST ANSWER: TransTint, being a dye, can be thinned with water, denatured alcohol or whatever is compatible with your next coat. So... if you are adding this to epoxy, it doesn't need to be thinned at all, but depending on what color you are looking for, you may only need a a single drop or two. You can add it directly to epoxy or any other finish you want. It's really versatile. No thinning necessary. Just a drop or two and you're set. Are these dyes food safe? 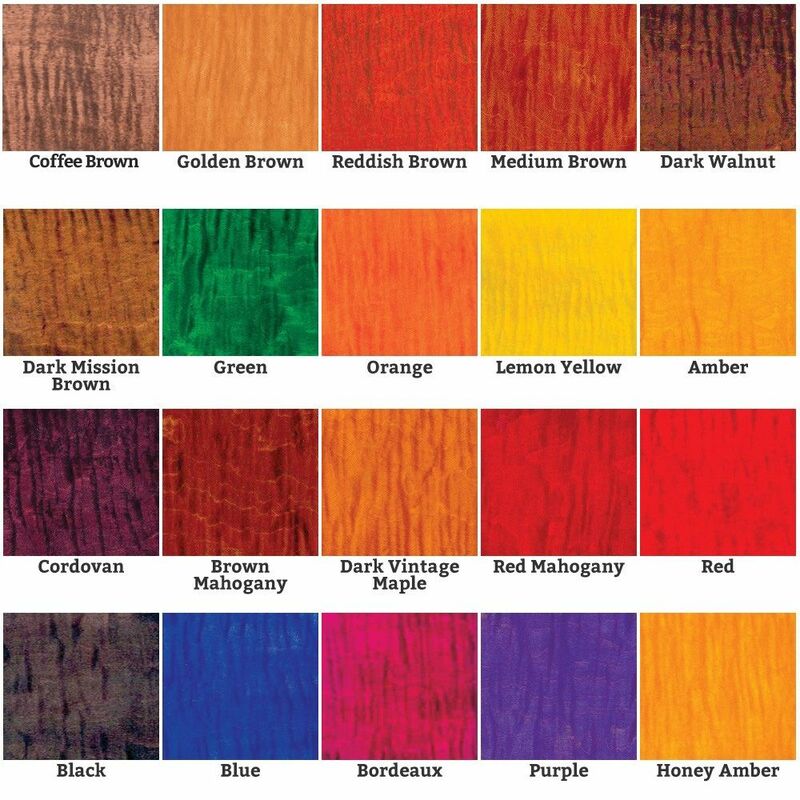 I'm looking for dyes to use on chopping blocks/cutting boards. The dyes we sell are not poisonous, but some are harmful if they are swallowed or ingested. Refer to the MSDS for each individual dye here. Bob Flexner's 'Understanding Wood Finish' book, indicates that a 'finish' will be food safe after it's completely cured. I believe that if you use any kind of colorant, it will not last long on any surface used as a cutting board. i used the dye on salad bowls and serving trays and never Sean any color or taste to the food. Can I use this on outdoor furniture if I coat it with polyurethane? BEST ANSWER: You should check with the manufacturer, but it's my understanding that wood dyes tend to fade over time with exposure to sunlight. Otherwise, there's no other reason that I know of not to use them on outdoor furniture. Also, polyurethane on outdoor furniture can fail after a few years because UV radiation breaks down the wood below, which then causes the polyurethane to crack and peel. I would use it underneath polyurethane, however I would not leave the furniture outside all year long. Please review polyurethane versus spar varnish for exterior use. 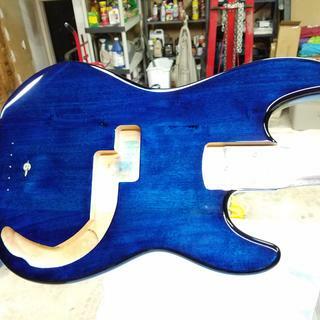 I bought the dye to build guitars and covered it with lacquer. If you put 3 or 4 good coats on I don't see why it would not work. will this dye mix with epoxy? BEST ANSWER: Yes but it depends on your application. I use it to tone the epoxy for repairs and small fills. there are other less expensive and more mixable pigments for large volume applications like river table pours and bartops. Yes I have used it for acrylic and 2 part epoxy, I also use it with shellac, 1 part shellac 1 part alcohol and transtint dye amount what color intensity you desire. Contact Jeff Jewitt at Homestead Finishing Products - he's extremely helpful and quick to reply. do i understand this correctly-these may be mixed into water or oil base or just laquer thinner or alcohol ? Denatured. Can be found at most paint or hardware stores. The bottle states it can be used in water or denatured alcohol, as a stain. It can also be used in shellac, solvent lacquer and water base finishes. I have used TransTint only in water, and had great results. I have only used them mixed with water. A tiny amount goes a long way. Careful using because it dyes everything it touches; wood, clothes, skin, etc. You can definitely use water, but they seem to be much more soluble in alcohol. I have no experience with oil base. 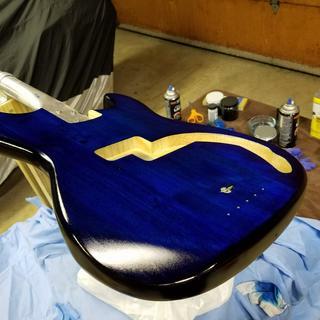 What type of top coat is best for a high gloss guitar finish? BEST ANSWER: The best top coat, in my opinion only, and I speak from having both a classical and a flamenco guitar, that a well rubbed in multi coats of lacquer will do the best. Heavy single coats should be avoided since they can alter resonance and create orange peel. 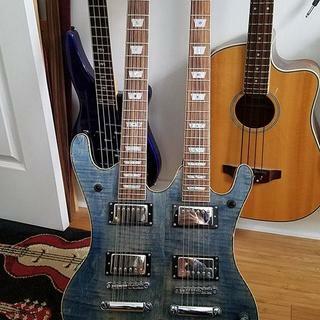 If this is for an electric guitar, the field is open. Thickness does not play such a heavy influence and will only give the "looks". You could do an internet search to affirm my opinion or even call Tailor Guitars in El Cajon and see if they will divulge. Remember top do this in a very clean room and well ventilated. Lacquer can be very harmful when breathed in. Hope this helps. Professionally manufactured guitars have been finished with shellac, lacquer, and polyurethane. It comes down to personal preference, however, lacquer finishes tend to look better longer. 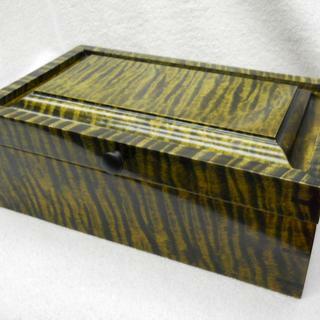 I used the Transtint on a jewelry box with quilted maple and finished coated it with Arm A Seal General finishes. I used four coats and it worked great. Good finish tough as nails. Lacquer, 15-20 coats but first you must grain fill . I use Behlen string instrument lacquer. I hope that this helps. Is there a certain grain fill you like and can recommend where to purchase it? best thing to use as a top(finish) coat over trans-tint ? BEST ANSWER: It depends on what you are finishing? I assume you have used transtint to stain something wood an interesting color? After letting it dry for at least 24 hours use general finish wipe on polyurethane. Wipe this on evenly with a clean rag - the first coat will seal in the dye and you may notice some coming up on the rag. Minimum of three coats with 24 hours drying in between. Use superfine steel wool 0000 to "sand" in between the coats and after the last coat to get a silky smooth finish. This finish works well especially on furniture. Also if you want to darken or change the tint on the piece you can add a little transtint to the wipe on poly. Any oil based polyurethane with a brush would also work but not give you as nice a finish unless you could spray it. If you want any level of durability or to enhance the wood grain stay away from water based polys. I haven't had a problem with any type of topcoat I've used varnish shellac and even linseed oil and the dye doesn't seem to be effected. I used General Finishes Arm-R-Seal Urethane Topcoat-Gloss (wipe on formula) with excellent results. 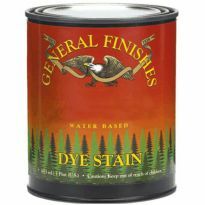 Can this type of dye be used as a solution for minor damages to wood furniture? For example, I have a cherry wood table that got a little banged up during my recent move - There are lighter spots where the finish was chipped off - Can I use this on those specific spots to cover up the damage? BEST ANSWER: Sounds like you are willing to go with the "Old English" approach. You would not be happy if you tried to use this product straight out of the bottle for spot coverage -- it is way too concentrated. But, if you want to experiment; try putting a drop or two in a small amount of denatured alcohol (say a tablespoon) and dabbing it on with a pointed stick or a q-tip (have a paper towel handy to catch any extra that tries to run down the surface). If you like the color match, you have at least removed most of the visual impact of the chip. The next proper step would be to seal it in with a clear finish. BTW, I would advise against using Old English, ever. Thanks John. What brand of de-waxed shellac do you recommend? Also what would you say should be the ratio between the tint solution and the de-waxed shellac? As you can tell, I'm quite the novice and I really don't want to ruin my table. Would it make more sense to restain the entire thing? Can one do that? Thank you Eric. So that I know all of my options, where would I find a touch up pen or oil pencil? Does Rockler have something like that or would home depot? Yes, Rockler has a nice selection, as well as Daily's, Home Depot and Lowes may as well, Hope it works out"! 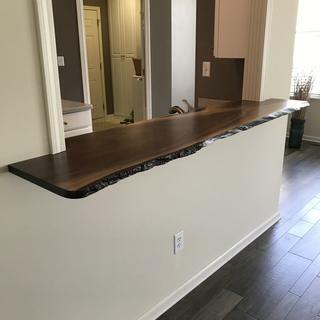 no this wouldn't help you in that situation what you would want to do is to apply the type of finish that was on the original piece of wood and that would be helpful in your damaged areaEnter an answer to this question. Can this be used to tint resins? BEST ANSWER: Yes. I've used tints with resins. But there are different "resins". A trial non-catalyzed small mix always a good idea. If it blends evenly, its compatible. Further guideline is don't use more Tint than you need. Black for instance : A whole bottle will give you black, but so might a much smaller amount. Potent stuff. Compatibility can have a tipping point by volume percentage of the 2 liquids. I have had success tinting most finishes and some wood fillers. It does not mix well with petroleum-based products or oils. An extremely versatile product. I use it often with shellac and denatured alcohol as a sealer in the first step of my finishing process. Can't help. Have only used it in epoxy. how much will a bottle make? About 2 quarts but it depends on how dark you want your mix. A second coat of stain will darken but intensify greatly. Unfortunately that is very dependent on how dark you want the tint. 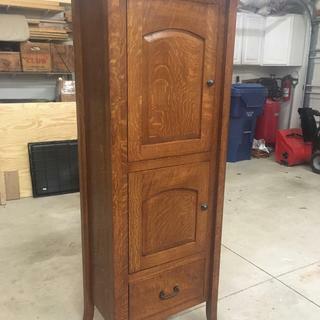 I want to use a tung oil final finish, can the dye be uses to tone the wood and would water based or alcohol based be recommended? BEST ANSWER: You can use either water or alcohol. Keep in mind that in general, water will raise the grain of the wood more than alcohol, so using water as the base will require more finish sanding. The amount of grain raising will depend on the wood species. Alcohol as a base will raise the grain less, but you will have a shorter working time...as soon as the alcohol evaporates, you won't really be able to work the color in smoothly, so it can be blotchy. The dye itself tends to be very dark, so it won't take much dye to base to start getting some color into the wood. Try a small amount with both water and alcohol and see which one will work best for you. Water = more finishing work after, but a better chance for more even coloring. Alcohol = less finishing, but much shorter working time if you're not used to the drying time of the alcohol. The dye CAN be used to tone the wood. Either water or alcohol can be used, but if a water base is used, it could possibly raise the grain and you would have to again fine sand. 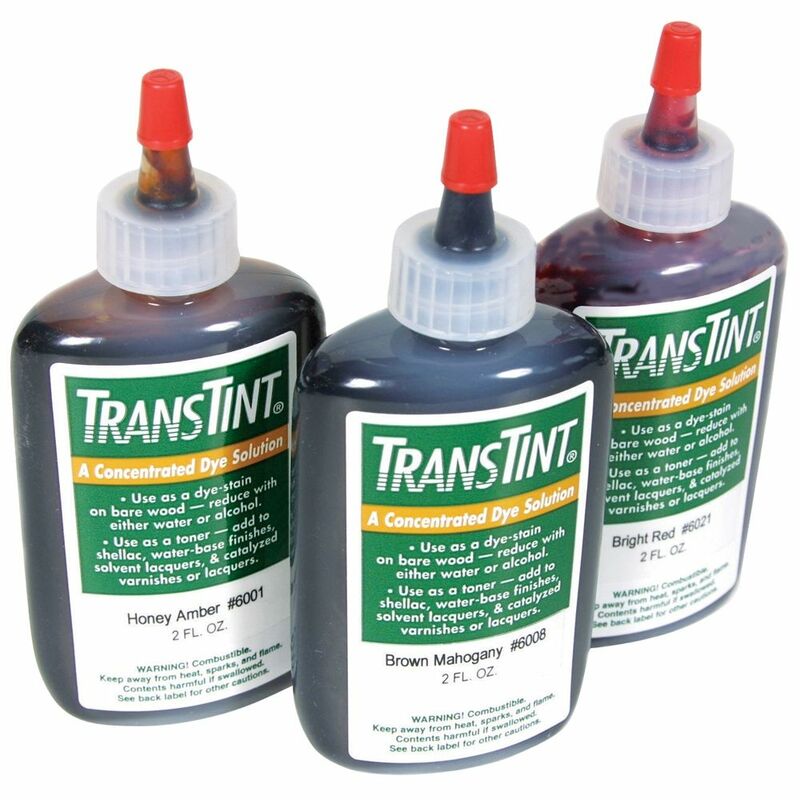 Reading the product overview, it appears that TransTint can be mixed with the tung oil and applied as a finish toner. Experiment with this on a scrap sample. Yes I have used the dyes in tung oil, it works but it does not produce quite as pronounced a color. I normally put some tung oil in a cleaned baby food jar then add the dye to the oil and shake. I use the tinted oil for all coats. Good Luck. Should I seal before adding oil based stain or should I put stain directly on top of the water based dye ? BEST ANSWER: Chris: I would not put oil based stains over water based aniline dyes with or without a sealer. The end result will look muddy. A primary reason to use dyes is to preserve the transparency of the wood grain. 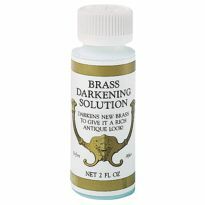 If the reason for adding an oil based pigment stain (someone on one of the chat sites called these a dirty brown lie) as a top glaze, is to darken or shift the color tone, I would simply add additional coats of the dye, or use a different color dye to achieve the look you want. Highly recommend the color wheel approach in Jeff Jewitt's two books offered by Taunton Press. Jeff owns Homestead Finishing by the way. Hi, thanks for the reply. I was worried about that. 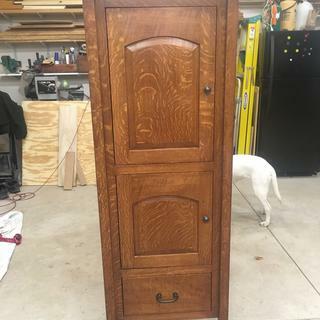 The problem that I have is that it's white oak I'm staining so I am concerned about the pores not taking the dye completely. I'm trying to get a really dark brown without going black. I can achieve that with multiple coats of the oil stain I have but not consistently on every piece that needs stained. I've tried gel stain but it just covers the grain too much. Should I try a water based stain on top of the dye or do you think that I can get multiple coats of dye to cover evenly ? Right now I have dark walnut transtint. In general would put the oil-based stain right on top of the dye (after it dries, of course). This works really well to reduce the contrast between early and late wood in species where they contrast greatly. Putting the stain over sealed wood effectively renders it a glaze. Yes. add sealer between the dye and stain. Can you put TransTint dyes in a NSK airbrush? Do you need to dilute it first? If so, what is the dilution ratio? BEST ANSWER: Airbrush application depends on what you want to paint. Transtint is a concentrate and must always be diluted. Choose a medium suited to what you want to paint. Water or acrylic medium for paper, 2d art, lacquer, alcohol, or varnish for wood, enamel or epoxy mixes for china. The dilution ratio depends on what color is desired. Also, multiple coats can change the color or "depth" of the look. A few coats of colored lacquer or varnish dyed with the Transtint gives an effect af looking more deeply into the piece. An old Dutch Masters trick called glazing, also used in oil painting and antique furniture restoration and reproduction. Color results also depend on how deeply Transtint colors different mediums different ways. Do not mix in the airbrush's container but a separate one which you add to the container attached to the nozzle. Less is more. Add a tiny bit, spray or brush apply to a sample, adjust with more Transtint as needed, drop by drop, or less. Yes, TransTint can be put through an airbrush. Read the Mfgr's Datasheet for methods of application, ratios and curing times and finishing. I have found that it is always best to try whatever method on a scrap piece of the same project wood. This allows you to experiment without harm to the project piece. Sure. No. I don't think you will get good results airbrushing TransTint dyes. It'd be like airbrushing watercolor paint. The result will be transparent. Also TransTint is way to expensive. The 2oz bottle for $22 won't go very far. I ordered and received transtint dye Red Mahogany. I mixed it with water and tested it on a piece of wood. It was not as red as I wanted. The color chart appeared to have more red than I got on my test piece. I was going to order the deeper red and try this. I will try this alone and mixed with the red mahogany. Any suggestions on how to mix this dye to get the desired color and brightness I want? BEST ANSWER: The intensity and depth of color when using transtint dyes depends on the proportion of dye to solvent (water, shellac, or whatever you're using) in the solution. To get the color intensity as shown on the color charts, the ratio is one ounce of dye to one quart of solvent. What I've found helpful is to add the dye to a smaller amount of solvent. To get the color intensity I want, I add one ounce of dye to one-half quart of Bullseye clear shellac. I then try the mix and add more shellac to adjust if needed. Keep in mind that the color will look different on various species of wood. I'm afraid it will need to be trial and error. Keep careful track of the proportions you use and note the results. When using water based products like this the only drawback is that it will raise the grain on the wood when you apply it. There is no way to avoid this but you can intentionally raise the grain with water a couple of times prior to using this and then sand down again until it doesn't return. That's the only way to assure a good smooth finish. Good luck! you may have used excess water on first try. try again starting with a 1:1 ratio unless otherwise suggested. then increase water amount to lighten up hue to what you want. Does it penetrate the wood so it can be sanded down or planed and still retain color? BEST ANSWER: OK--dye only sinks so far into the wood, plus it depends on if the wood is porous, hard, soft, etc. If you are careful, you CAN make amazing effects removing some wood after dying . Don't ecpect to plane or sand off 1/4 inch and have the dye be just as applied to the surface. For all over even color, best to dye AFTER all sanding and shaping is done. Effects: dye, then sand the higher areas of the dyed piece to create lighter contrasting wear patterns or lighter areas in a design: lower bits stay darker. Like the knobby bits on a candlestick or carving. Raised grain on weathered wood (driftwood, weathered wood, etc.) can be sanded down after dying for a magical super show of grain on the wood. Great for unique trim, a picture or mirror frame, or rustic furniture. Remember to seal the wood after you're done. Very well put and helpful information from Kim N.
I used it on maple and I would say no. Can the dyes be used on children's furniture if top coated with polyurethane? Yes. Oil or Water based? For both, scuff surface well with a new green scrubbing pad, like for dishes. You can skip this, but it really helps. For oil, mix tint into alcohol and apply by wiping with a small (4" x 4") soft rag, like a terrycloth towel scrap, well dampened but not sloppy dripping, keeping a wet leading edge. Let dry 5 hours and re-coat with dye to deepen color and cover streaking. Topcoat with wipe on type oil varnish. Water based top coat will lift the dye and ruin it. Oil only for sealer/topcoat. If original poly coat is water based, mix tint with water--alcohol will dissolve water poly. Gel varnish will work for topcoat too. For added depth, you can stain or glaze dye layer with a gel stain before the final wipe on varnish. No problem. Just let it dry overnight. BEST ANSWER: I don't use TransTint in that manner. I use it to color resins and epoxies. My own feeling is NO. There are CAUTION and WARNING statements on the back label, with reference to State of Calif. known hazards. Best bet would be to get the Mfgr's Safety Data Sheet and data from the company's website. I would NOT recommend these dyes for anything where food will come into direct contact with the finished surface. Can this be mixed into prepared 3# cut shellac (Rockler, garnet shellac kit) to deepen the color (from more orange to more brown)? I am trying to get new red oak trim in a renovated kitchen to match the trim in the older parts of the house (shellac on red oak, ca. 1890). BEST ANSWER: yes you can use with a three pound cut. but I get better results mixing it with alcohol and putting the shellac over it. it mixes well with water but tends to make the fibers stand up requiring sanding before applying shellac. Directions show it can be added directly to shellac, most water based finishes, solvent lacquers, pre-cats, post catalyzed and conversion varnishes to make toners and shaders. I need to get my maple to a darker tone. Do I need wood conditioner such as benite before I apply dye, stain and finally, a clear coat? 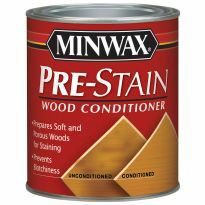 BEST ANSWER: Benite (the conditioner I use) or any other wood conditioner is designed to allow a stain to soak in evenly. It does this by filling in the wood pores with something akin to a sealer. Then when a stain is applied, it doesn't soak in as deeply. As an example, Maple will have a tendency to become splotchy when staining, the conditioner would be used to prevent that. 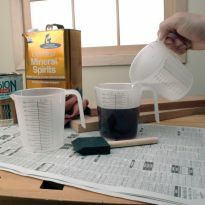 In general, you will find that Maple doesn't absorb much stain, and applying a lot will make the color look 'grainy'. You may have better luck sealing the wood w/Shellac Sanding Sealer then use a gel stain which isn't so much about soaking into the wood but laying the color on the surface. And then applying several coats. No.. Simply mix a darker solution of Transtint using denatured alcohol. Wipe on or better yet Spray on, if possible. Med. Brown. Walnut. Mission colours. ? I'm shooting for a dark walnut type color. I just do not want it to blotch. Are you saying I do not need a stain on top of dye either? No mix that with shellac and it will be the perfect start to a finish. can I use this product with a spray gun? BEST ANSWER: I can't think of a reason why not. I added some to sanding sealer I sprayed. But depending on how porous the wood you're dying, you might get better control of color saturation with a rag because you can go over spots where denser grain absorbs less. Direction show it can be sprayed. the limitations would based on what you mix it into. Do not used it oil based finishes or those containing mineral spirits. I would think yes, but I do not have spraying capabilities. Can I add this to an oil based product? I want to use Odie's oil and the recommend tinting the product. No.. You can only use water or alcohol, for dilution or a base. Not oil based product. John Steffen. Can this be used with a 2-part epoxy crack filler? If so, in what ratio? BEST ANSWER: It took just a drop or two in epoxy to color the epoxy (West Systems) very black. Mix epoxy for a minute first and than add the tint. No thinning of tint necessary. Jim, I have used Transtint with great success but only in water based sealer and finish. Try to mix up a small sample and experiment. In finish, I mix ratios from 1 to 6ml per pint depending on the intensity of the tint and the color I desire in the end. I use a plastic syringe from CVS in the baby medicine aisle to measure out in ml. Easier than counting drops coming out of the bottle. Hope this helps. I have successfully it with shellac and water based finish, but it does not mix with mineral spirits. So in your situation I think experimenting is the only way to go. If it won't mix in, you could try using furniture powder colors instead. Can I use this product over 1coat of oil base stain that is showing too much grain? BEST ANSWER: OK--"too much grain?" dyes are ground too fine to occlude the grain. Just top coat with gel stain (larger pigment particles) which will hide grain a bit. This is an oil based product and can go over another stain, tint or varnish. Alternately, you CAN use a transtint dye right on top of another stain or varnish and it will stain right through the finish. You can darken a lighter finish this way, if that's what you mean by "too much". This dye is meant to be applied to unfinished wood with open pores. If you have oil base stain already on the wood, it would be better to sand off the stain and then apply the dye in either a water or alcohol suspension. 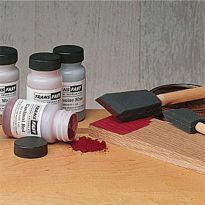 These dyes are used to create a dominant undertone to the wood before sealing and then using other finishes such as gel glaze stains or clear coatings. i suggest asking the folks at Transtint. 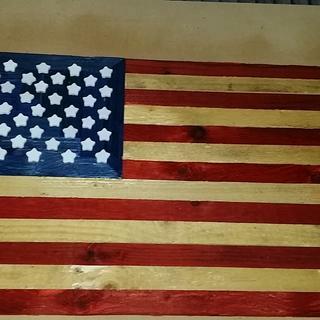 I used it on unfinished wood, sealed it, sanded it and then applied a stain before finishing. This is how it is intended to be used. 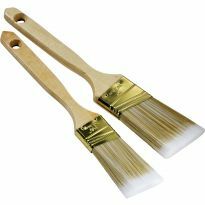 Can this be added to water-based varnishes to mimic the warm color tone that oil-based varnishes give wood? My latest project was a bench below a window and I had to use varnish dur to its uv protection and the varnish and dye worked well together. My only question is why would you want to mix this with varnish rather than apply it as intended. A dye soaks into the wood to give uniform color rather than sit on the surface like a stain. By mixing with varnish you would effectively be making a stain. Sorry, I have not used it yet on the project I got it for. 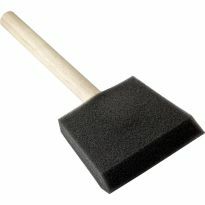 Can I add this to polyurethane to color maple blue, red, or green? BEST ANSWER: This Question » Yes, you can but you shouldn't . The best way to get the full rich tint of those dyes is to add them to de-natured alcohol (i.e. not "rubbing " alcohol) or water. I like alcohol because it doesn't raise the grain. Apply with a decent sponge brush or a small rag lightly wetted by the dye but not drippy. . Keep a wet leading edge to avoid streaks and wipe drips and spots as you go with a paper towel. Not wearing gloves will leave your hands tinted for a very long time. Let dry overnight, or a least 6 hours even though things may seem dry. You may re-dye the object again if you'd like a more vivid tint. If you add the dye to the finish, the poly. you mentioned, what you are doing is creating a light glaze which will not color the wood deeply. 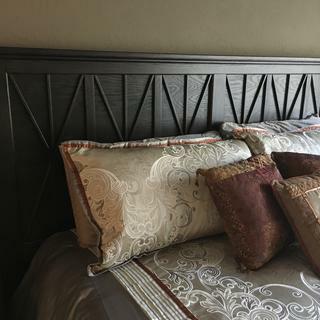 You will have to apply coat after coat to get anything like a deep color and not have very good control over the staining process, plus, you may get lap marks in the finish color which are unsightly. Especially on maple, which is hard to stain. 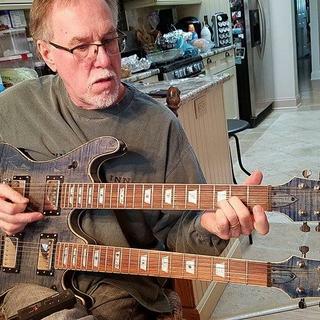 I can tell you want to get a rich tone because of the colors you chose. That's why the Transtint in alcohol is great for staining maple--it works when nothing else will--regular stains just stay on the top, which may be why you are trying to put the Transtint in the poly finish. You are in for a real treat--surprise--something which will color a hard wood with deep rich color. Also, try the dye, then use a stain over it for a nifty effect. Possibly a gel stain. Don't use "hardware store" gel stain--Rockler has heavily pigmented lovely gel stains they sell and accept no substitutes or you will be disappointed. But it would not be an issue to add to Poly, if I wanted to add a little more tone to my finish, for an already stained piece? You can , however I would encourage you to Die the wood first. Seal coat, then urethane. I'm going to die my seal coat because the wood is too light and already sanded smooth. Can this be used under danish oil? I see that some have used it successfully under tung oil and would also love to hear more positive or negative reviews on that as well. BEST ANSWER: Although I have never used danish oil, I don't see why you couldn't. Your applying a solution of the dye mixed with water ( or something) and applying it to bare wood. It will tint the wood and dry leaving the wood like it was before, except tinted. You can mix colors together, or add colors in layers which really gives you a lot of play room. I like putting the colors on in layers. I have had no problem sanding the color out if I was totally unhappy, which only happened once. I don't know if it would mix with a cup of danish oil, but give it a try, if it separates, you are not out that much of either. I haven't done it yet, but I saw on YouTube you can mix it into lacquer or varnish then spray or brush it on. Myself, I like to put it directly on the wood. Oh, and a little goes a long long ways. (and now the disclaimer).......Try it on a piece of scrap wood first. I’m talking about dyeing the wood (water solution) and then using a danish oil or tung oil once totally dry. Have you tried it on pine? Concerned about blotches. One last quick thought on blotches.. Put a coat on and let it dry, it will change color while drying. If it's not dark enough, add a second coat. You will see blotches while it is drying, but it ends up even when all dry. You may have to lightly, and I do mean LIGHTLY wet sand with 400 grit wet and dry sandpaper with water as the grain most likely will raise the first time. After that, you should be good. This dye drys real fast too. I plan on tinting a water based polyurethane. I want to end up with a ginger ale color. Anyone know what colors I would need to create a ginger ale or champagne color? Thanks! BEST ANSWER: To be honest, I don't think anyone will be able to answer your question. Since your tinted finish is transparent, the final color that you get is a combination of the tinted film coat plus the color of the wood you're coating. You'll have to experiment with different concentrations and mixtures of dye such as Coffee, Amber, Yellow, Golden Brown, etc., until you find what you want. A single color in the right concentration might work, or some combination of colors might be necessary. Remember, since you're planning to add the color to the finish, with each coat of finish, the color will get darker. You might try, instead, dying the wood and put an untinted coating on top. You're so kind, Marty. I forgot to mention the important part. The wood is a lamp base which I have S ilver leafed already. I want to tint the polyurathane so that the final look is a champagne hue to the leaf. I'm trying to replicate a lamp base I have that was done in the fifties, and it's got me stumped. Thanks for any ideas you might could come up with. My thought now is to apply the leaf to some sample boards and then try different mixtures of dye/finish until you get close enough to what you want. That's a smart plan and I'll do that tomorrow. The colors they present are so vibrant, so I can't figure how you get any of them to mix to a champagne color. But I'll try the color wheel and see what makes up that base. Perhaps it's something as odd as brown and white. Thanks again. When you dilute the tints sufficiently they are not so vibrant. Champagne is basically a light earth tone - it might be as simple as diluting brown considerably; possibly with a little yellow added. Dilution is probably the coarse of action, not the addition of white (I'm not sure there is a white Transtint.). I finally came upon a solution. I was Silver leafing my wood and trying to find a way to color clear polyurethane. 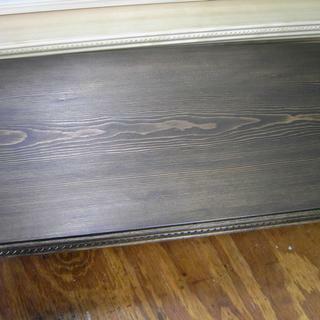 Much simpler is to eliminate both steps, then spray the wood with metallic paint. Then poly on top. Duh - I took out unnecessary steps and it became cake. Thanks for all the help. If you go on the internet and type in "color wheel" you should be directed to one of many sites which have information regarding the combination of colors to create custom colors. I used trans tint dye, which had been diluted with alcohol on a pine table that had been sanded with 220. I then applied zinsner seal coat with a brush. You can see the lines where it dried before I had time to keep it all wet. I tried to rub in more of the diluted dye. It only made it worse. What did I do wrong? BEST ANSWER: Your problem was the order of operation. Next time use the a shellac seal coat before you use the dye. Another option is to add the dye to a varnish. That is my experience and it works well. With a highly figured wood Which may "spot" and "streaks" that show up after you apply the first coat the Varnish first approach can work well. Can you use this on new pine beams that have been distressed as well as new pine floors? I'm trying to soften the effect of the distressing. BEST ANSWER: Yes. Remember to mix it by only adding a few drops at a time to your medium and to keep a wet leading edge when you apply it. I think alcohol is the best to mix it with, not water, which will raise the grain. No rubbing alcohol (isopropyl alcohol) since it has water in it. I use a very small rag, like a scrap of towel for best coverage and speed. Covers scratches and dings well. I'm thinking pre-stain conditioner on all soft woods, ie sugar pine, doug fir, etc. can this be applied over clear coated white paint ? Yes. Not for painted surfaces.